At left, detectives display one of the cars used in the robbery. At right, they inspect a railcar. A broken window is clearly shown in the photo. Robbers broke windows when employees refused to unlock doors from inside. At about 10 p.m. on June 12, the Chicago, Milwaukee, St. Paul train slowed down just outside the town of Rondout, Ill., to pick up their orders from the order hoop located on the Rondout Tower. As the train approached, Wylie and Holliday, dressed as railroad workers, walked onto the tracks and held up red lanterns signaling the train to stop. As it did so, the rest of the gang, driving stolen cars, quickly pulled into place and illuminated the train. The gang quickly started to force crew members outside. Staff in the rear cars, however, realizing something was wrong, immediately turned off interior lights and locked the doors. The thieves had accounted for this, however, and began to break windows and toss in tear gas canisters to force the workers inside to open the doors. At that point, everything was going according to plan and using the railroad staff as labor, the gang moved more than 60 cash-laden bags into four cars in less than 25 minutes. However, during the loading of the bags, two things happened that would alter the robbery and a third misstep would seal the gang’s fate. First, brakeman Sandy McRae suggested to the robbers that he should set out flares down the line behind the train. Rondout was at an intersection, he said, and another train was due to arrive soon and could possibly hit the train if the warning flares weren’t placed. The gang agreed and, since they were in a remote area, they sent McRae on his own to set the flares. Once out of sight, however, he ran in search of a farmhouse to call police. Allowing him to go on his own was the gangs’ first mistake. When McRae failed to return, the robbers grew nervous and likely realized its mistake. As a result, Wylie was sent in search of McRae …. which resulted in the second mistake. One side of the train was illumined by the cars’ headlights, but the other side was in darkness. Wylie started out on the dark side and as he stumbled in the darkness, he opted for the light and crawled under the train to the illuminated side. 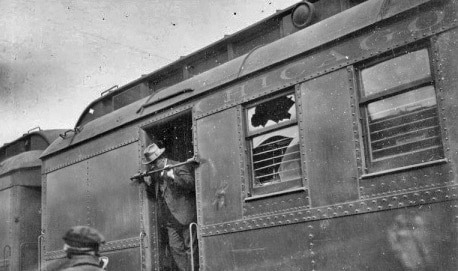 Popping out from under the train, Wylie, armed and still dressed as a train employee, startled the robbers and at least one of them opened fire, striking Wylie five times. That was the second mistake. The wounds weren’t immediately life threatening but would require medical attention. The gang, still loading their cars, placed the heavily-bleeding Wylie on top of some mail bags. This wasn’t good. They shot their own man, lost track of at least one employee and were unsure if any of the employees in the rear cars were armed, or if police had been alerted by the missing man. A decision was made to leave the scene, abandoning any money bags still on the train. They headed to a safe house in Ottawa, Ill., where the money was sorted and divided. Who actually shot Wylie is a matter of debate, and there are various accounts of what happened. However, most sources point to Glasscock as the shooter. As the gang feared, McRae did manage to contact police, and shortly after the gang fled, police and postal inspectors were on the scene. Thanks to good police work and poor decisions on the gangs’ part … including the gang calling Wylie by name after he was shot (the third mistake that night) … the case would be solved and everyone arrested and on trial in less than four months. A lesson relearned by the Newtons ….. stick to your own and stick to what worked for you in the past. Fahy was the first to seal his fate … and give police its big break. Fahy had a habit of always arriving at crime scenes much earlier than he should have and it didn’t take other inspectors long to realize he must have had some sort of advance knowledge of the robberies. Rondout was no exception so, using a wiretap, inspectors quickly caught Fahy having a conversation about the robbery with one of the robbers, likely Murray as he was Fahy’s go-between with the Chicago mob. The dominions fell quickly after that and everyone …. except O’Banion and Weiss … was arrested. O’Banion and Weiss, no doubt using their extensive political connections, were never officially linked to the crime. Dock and Joe were the first of the brothers to be arrested. They were taken in a Chicago tenement after police were tipped about an underworld doctor's visit to treat a wounded man. Willis was arrested the following day when he went to the room to check on his brothers. Surprisingly, he nearly bribed his way out, offering $20,000 in cash to the arresting officers. They allegedly took the money, but were double-crossed by a supervisor who felt he wasn’t given a fair share. With Dock, Willis, and Joe in custody, Glasscock hid the bulk of the money and went into hiding, while Jess headed south to the safety of his home state of Texas with $35,000. He eventually made his way to Mexico, but was tricked back across the border into Del Rio, Texas, on a barroom bet involving a bronco ride at an independence day rodeo. The arresting officer was Texas Ranger Harrison Hamer, a brother of Frank Hamer, the famous Texas Ranger who tracked down Bonnie and Clyde, as well as many other wanted criminals. Chicago newspapers portrayed the Newton Boys as “colorful cowboys” because when Jess was brought to Chicago, he was still wearing the colorful rodeo clothes he was wearing when arrested. Glasscock’s arrest followed soon after, as did those of Murray and Holliday, and newspapers quickly reported that all but $100,000 was recovered. By the end of the November 1924 the trial was over and the robbers were on their way to prison sentences. In all, eight men were convicted: the Newton brothers, Fahy, Holliday, Glasscock and Murray. Luckily for the Newtons, the prosecutor was more interested in making examples of the postal inspector and his underworld connections than four presumably minor characters. In exchange for testifying against their accomplices, the Newtons received amazingly light sentences. 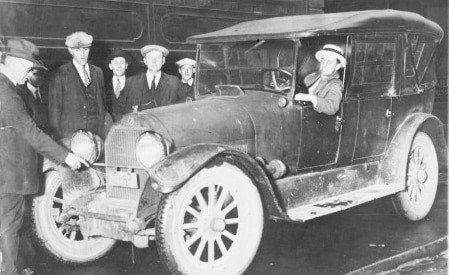 Jess was out of Leavenworth in nine months, Joe in a year, Willis in four and Dock in five because of extra time tacked on for his 1920 escape. Murray was given 10 years and Holliday 25. Both would be released early because of good behavior. They all served their time in Leavenworth. 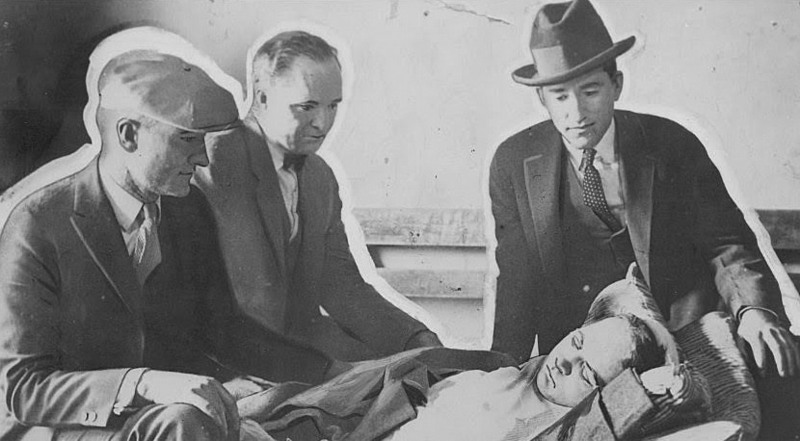 Brothers Jesse, left, Wilis and Joe are pictured with a wounded Wylie during their trial.